Hand Knit baby sweaters in Alpaca Boucle & Candy Stripe Baby Alpaca from Peru. 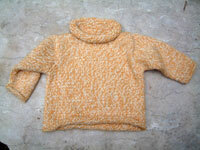 These handknit Kids Sweater come in a range of sizes, from newborn to toddler & 4T/5T. Peruvian Alpaca is a luxury fiber, but one of it's secrets is versatility. Both of these hand knit kids sweaters are made with a no-itch boucle yarn (loopy) which is very sensible. It functions much like down, keeping warmth in when you need it, but allowing air to breeze thru to keep you comfy. This is great in our world of uncontrollable climate change:(school bus/school yard or Subway/Street--you know what I'm talking about) Did I mention fashionable? A perfect fall/spring sweater , its a hand-me-down for sure.